My Health for Life is a FREE support program and QLD Government initiative designed to help people improve their health and reduce the risk of developing chronic diseases such as type 2 diabetes, heart disease or stroke. 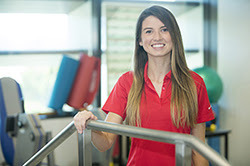 The program is being run by our resident Exercise Physiologist, Erin Barrett, who is a trained My Health for Life facilitator and has recently been recognised by the Gold Coast Primary Health Network for her outstanding contribution to the program. Location: Griffith Health Centre, Level 4, G40 building, Gold Coast campus. – gain support and accountability from other group members. Find out more: e.barrett@griffith.edu.au or 1800 188 295. To participate in the program you must first check your risk factors. Simply follow the link below to complete a quick and easy health check. Erin is an Accredited Exercise Physiologist (AEP) and Accredited Exercise Scientist (AES) with a strong background in the health and fitness industry. She is passionate about the My Health for Life program and is looking forward to helping people move past barriers that stand in the way of making healthy choices. Erin has a unique ability in finding physical activities and exercise options that are enjoyable and sustainable for each individual. My health for life is a Queensland Government funded program lead by Diabetes Queensland in partnership with the Heart and Stroke Foundations, Queensland Primary Health Network, Ethnic Communities Council of Queensland and Queensland Aboriginal and Islander Health Council.